The SPONGE consolidates a new thickened K–to– Grey waterfront zone that leverages on indirect learning and shared facilities between schools and community to bring about a cohesive identity. Over the last decade, Two Bridges has faced a worrying trend of population decrease, even though NYC’s overall population is on the rise. Saddled with a pervasive low quality of education,where public schools within the neighborhood have obtained some of the lowest educational quality scores in NYC, Two Bridges also faces an impending threat of coastal flooding. The scheme employs strategies of ecology, environment and storm-water management to encourage learning through process, and draws upon the notions of slips and piers to generate a consistent architectural and urban design language that provides equity of public space. By identifying and relocating existing & under performing educational facilities, under utilized open spaces and existing NYCHA housing that are in the flood zone, a thickened waterfront is created. The SPONGE, a new type of waterfront, now accommodates a variety of educational facilities that creates a K–to–Grey water front that provides an environment for direct and indirect learning around water related themes. Each structure contains amenities that caters to K-to-Grey users. This prevents segregation by age and encourages interactions between the user and its built environment since the user must move between the structures of the 'SPONGE'. 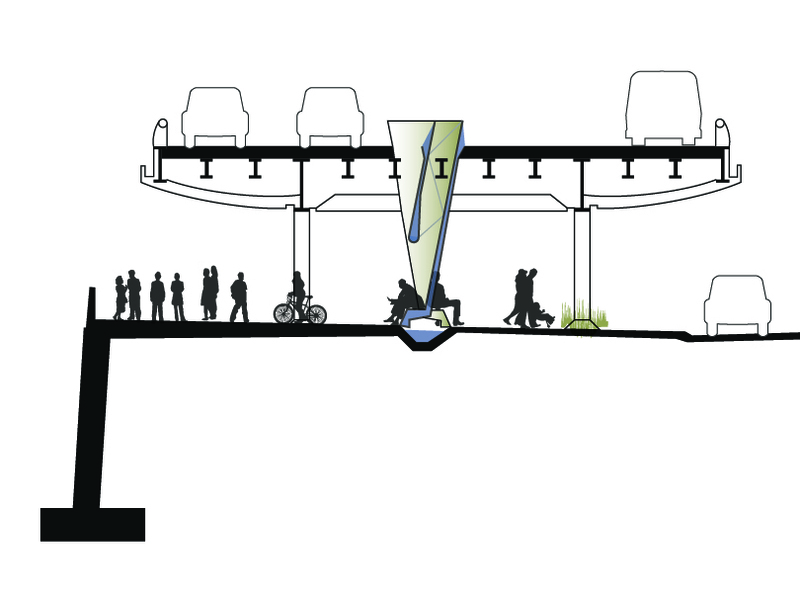 Interventions along the Elevated FDR Highway infrastructure creates opportunities to re-think the relationship between public space, water & education. The 'slips' provide better lighting and collect and channel storm water runoff from the FDR while at the same time function as a public space or outdoor classrooms for indirect learning at the waterfront. 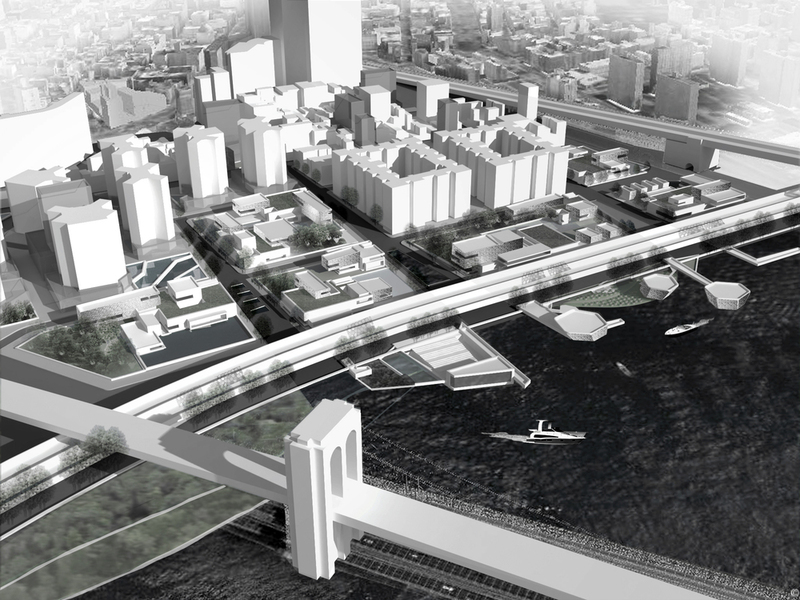 The piers are the points where the waterfront extends to the water to provide opportunity to engage with the water beyond the limits of the current linear waterfront. The piers provide public spaces such as fishing piers for the local community, open air auditorium and an oyster reef that re-mediates the water. The piers also function as Oyster Labs and classrooms. In the process, The SPONGE also rejuvenates and energizes the neighborhood by increasing affordable housing stock and injecting mixed uses. 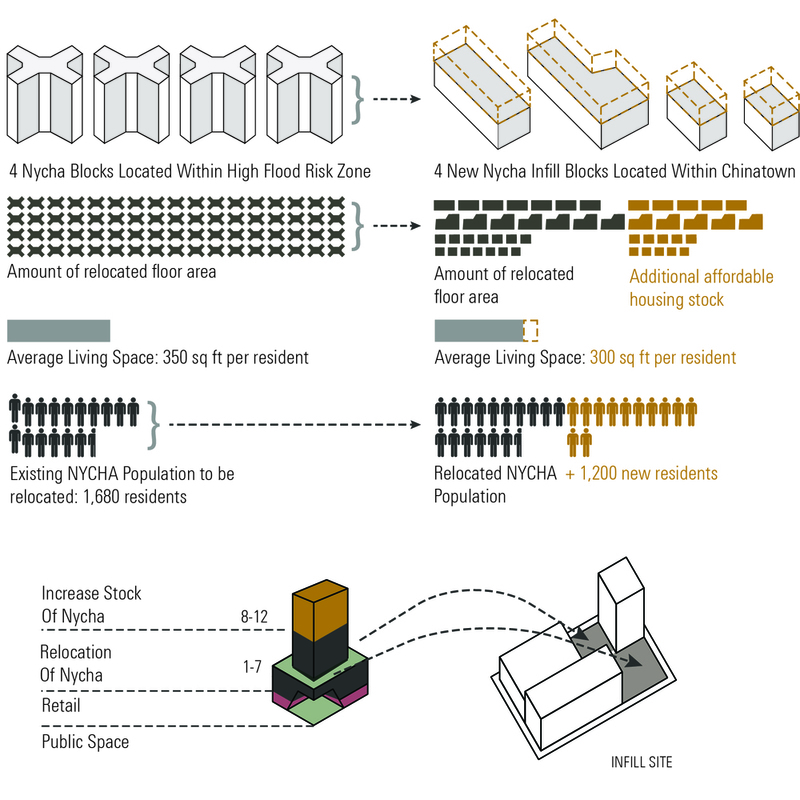 By Vacating 4 NYCHA housing structures from the flood zone to an adjacent in fill site in Chinatown, the sponge enables to protect the residents from future flooding but still retain them in the neighborhood. At the same time, the in fill sites allow for an additional supply of inclusionary housing which will allow for additional income for NYCHA which currently tries to mitigates its $ 850M deficit.